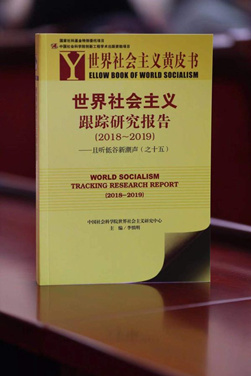 On March 2, the release of Yellow Book of World Socialism (2018–2019) and the symposium “The Socialist Road with Chinese Characteristics and Building a Community of Shared Future for Mankind” was held in Beijing. CASS Vice President and Deputy Secretary of the leading Party members’ group Wang Jingqing addressed the conference. Former CASS Vice President and Director of the Center for World Socialism Research Li Shenming delivered a keynote speech. Jiang Hui, a member of the leading Party members’ group of CASS and director of the Institute of Contemporary China Studies, and Zheng Keyang, former deputy director of the Policy Research Centre of the CPC Central Committee, made speeches at the conference. Compiled by the Center for World Socialism Research at CASS, the Yellow Book is a special project entrusted by the National Social Science Fund of China. It analyzes socialist ideological trends, theories, movements and systems all over the world from multiple perspectives, reflecting the latest dynamic development and research situation in the field of world socialism.